In selecting forest habitat management guidelines we should keep in mind that the response of snag dependent species to the increased availability of snags is not precise, but that populations do tend to increase with an increase in snag density. As a result, an increase in the snag management level will lead to an increase in the numbers and distribution of snag dependent species across the forest system. Habitat for snag dependent species can be improved by increasing the number of acres with snags, and appropriate distribution of size classes based upon species needs (Thomas et al. 1979). Methods that can be used to recruit snags over the long term include maintenance of older trees within stands, killing of trees, and retention of snags within managed areas. Thomas et al. (1979) suggest that by maintaining the hard snag requirements for primary cavity excavators and leaving all soft snags in place, all secondary cavity nesters will have their needs met. Thus if the requirements of woodpeckers are met, the requirements of all snag dependent terrestrial verte brates will also be met. Connor et al. (1976) suggest that woodpeckers, as primary excavators, can detect the presence of the soft heartwood associated with heart rot by trial and error pecking. Snags suitable for excavation should then be of the correct width and height, as well as show signs of heart rot. These signs may include conks, stubs of broken branches, mechanically induced wounds or scars, dead areas on living trees and woodpecker holes. 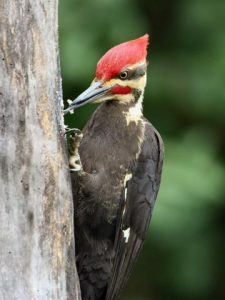 Territorial requirements of each woodpecker species within a forest community and the specific requirements for snags can be used to develop a ratio of size and height classes of hard snags per area, needed to maintain breeding populations of woodpeckers. The assumption is that all cavity users will then have their needs met. Three biological considerations are relevant: 1. the same snag can be used by several different cavity excavators; 2. birds of the same species will not usually excavate in the same snag; and 3. larger snags can be substituted for smaller ones (Thomas et al. 1979). Birds play a significant role in the regulation of forest insects and as an important vector for the dispersal of seed in a highly fragmented landscape. Most snag dependent birds and mammals are insectivorous and represent a major portion of the insectivorous forest wildlife (Beebe 1974; Buckner 1966, 1971). This moderating influence on insect populations has been identified in the reduced outbreak of forest insect populations (Soloman 1969). The importance of birds in insect control has received more attention in Europe, where shorter timber harvest rotations and intensive forestry has led to a loss of snag habitat (Bruns 1960). Logs are considered to be more important as wildlife habitat than any other form of dead and down woody debris, because they are more stable and persist longer (Brown 1970; Wagner and Offord 1972). Maser et al. (1979) suggest that the forest manager interested in CWD management consider the following factors: 1. snag management as an objective which will add to future log recruitment; 2. the density of stems needed per acre; 3. the various decomposition classes present and needed; 4. number and condition of snags; and 5. the speed with which a new stand of trees can be established. Leave all snags within the riparian zones adjacent to water bodies. Maintain a minimum of 6 snags per acre; 4 of which should be >24” dbh and 2 <24” dbh. Avoid disturbing snags during the nesting season (April 15th – August 15th). If snags must be felled during a conservation or management practice, leave it on site. If snags must be felled during a conservation or management practice, leave the log on site. Avoid damaging existing dead and down material during conservation practices. When possible, leave at least 4 decaying logs per acre; at least 2 of these logs should be >12 “dbh and >6 ‘long. On slopes orient logs along contours and place against stumps when possible do not add debris to streams and avoid disturbance to wood debris already in the stream. The next blog post in this series on coarse woody debris will concern urban forestry.